This amazingly delicious baked Pumpkin Oatmeal Recipe tastes like a cross between pumpkin bread and pumpkin pie, but in an oatmeal version! Combine all ingredients together in a large bowl, stir until completely mixed. 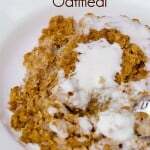 Pour oatmeal into a well greased 9×13 baking dish. Cover and refrigerate for one hour or overnight. Bake at 350° for 30 to 45 minutes, until the center reaches 160. Pour whipping cream into a bowl and beat with hand mixer on low until the cream starts to barely thicken, add a dash of extra sugar if you want the cream to be slightly sweetened.